Chinese Wild Yam plant, Dioscorea opposita. is also known as Shan-yao, Light Root and Cinnamon Yam. The delicious underground and ariel tubers that double as nutrient rich tonic. Hardy in most areas of mainland Australia. White, cinnamon scented flowers compel you into the garden at dusk and dawn. A treatment for irritable bowel, bed-wetting and nerve pain. 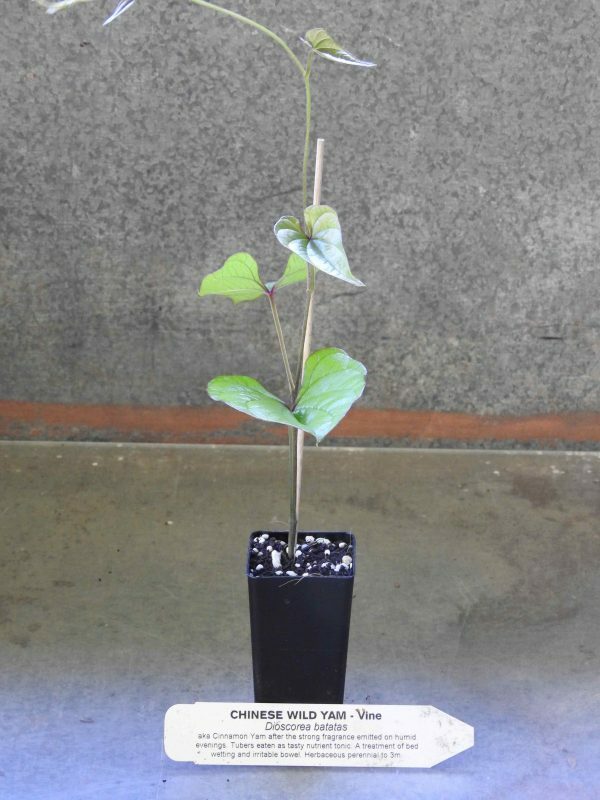 Chinese Wild Yam plant is native to China and Japan and prefers rich, well drained soils in a partially shaded position. Some frost and drought tolerance. A deciduous, vining perennial, growing to 4m. Be the first to review “Wild Yam, Chinese dormant July 2019” Click here to cancel reply.